Ronald Duarte and Emerging Collective joined forces to create "Gota D'Agua," a site-specific art intervention intended as a call to action in response to Brazil's water crisis. Strategically planned to coincide with UN World Water Day, Gota D'Agua gathered onlookers around an abandoned Olympic size swimming pool at the foot of Edificio Raposo Lopes, a towering luxury condominium building situated on a steep incline overlooking Rio de Janeiro. First, Duarte painted a giant white flag red, then engaged audience members in a rain-dance-joint-tree-memorial ceremony, dancing in circles around a deceased rain forest sapling. Following the ceremony, Duarte hoisted up the flag from the depths of the pool, dragging it up the side of the tower, visible for all of Rio to see. "Water shortage is an issue that the entire Global South can relate to, but one that is particularly felt in Brazil due to the mix of political corruption, big business priorities, and blowback from rainforest destruction," said Emerging Collective Founder Raj Udeshi. "Not one drop of water left next they'll take our blood that's the single line that inspired this visual action," said Duarte. "We made a rain ceremony in a disused pool, trying to resurrect a dead tree to make people realize that the loss of the rainforest is the cause of our water problems." 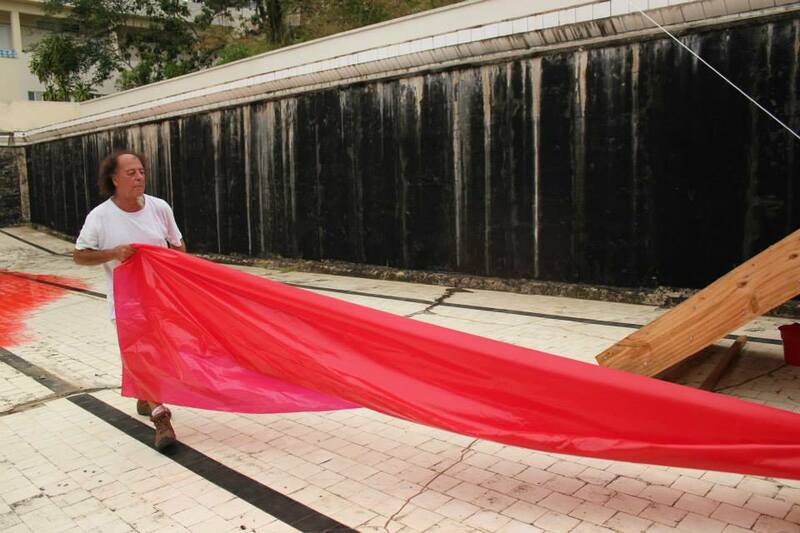 Whether by design or by chance, a torrential downpour greeted Rio on the day following the art performance. "Our intention was to capture the attention of Brazil's decision-makers, but we ended up waking the rain gods instead," said Udeshi. Following the art performance, Emerging Collective hosted a panel discussion highlighting the water crisis and deforestation issues as significant concerns for both First World and the Emerging Markets. The panel also served as a platform on which to trade ideas for inspiring artistic acts in times of crisis. Duarte was joined on the panel by Haroldo de Matos, head of United Nations Environmental Programme in Brazil, as well as Barbara Veiga, a photojournalist and eco-activist from Rio de Janeiro and Tom Punch, Global Executive Creative Director of VICE. Journalist Gabriela Machado moderated.